These mouthwatering milk chocolate 'Just Married' squares are great to put inside your favour boxes, organza bags or place in our table baskets for your guests to enjoy. You could even put 1 or 2 inside your 'Thank you' cards! 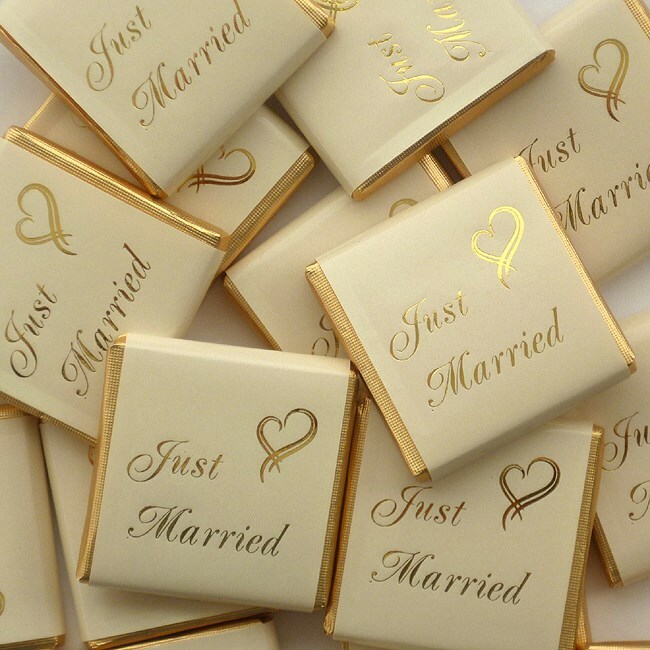 Smooth milk chocolate squares covered in gold or silver foil and banded in an ivory or white cover with lettering saying 'Just Married' . These chocolates are best kept in a cool dry place out of direct sunlight (10 -18 degrees Celsius). We recommend chocolates are purchased no more than 9 months prior to your function. Our Chocolate 'Just Married' squares are suitable for Vegetarians and are Alcohol Free.